Believing that this creeping crud I’ve been dealing with would surely be gone by now, we had made plans with two dear friends to have dinner tonight. And not just any dinner—a chance to introduce new folks to the artful and tasty talents of our friend, Damaris, owner and chef at Mi Tierra Latin Fusion Restaurant. There was no way a few sniffles and a little coughing were going to get in the way of the evening! I worked during the day, including getting Joe’s mock-up ready for his fitting this afternoon. Joe and Cindy have commissioned new duds that we’re hoping to debut at TRF. Allyson and Rod arrived at the house right around six, as planned. The missing cog in the wheel was Kyle. We waited a little while, and then called him to see how much longer he might be. We determined he should meet us at the restaurant, since the kitchen does close at 8 p.m. So, we dealt with pups, picked a second bottle of wine to go with the one Rod had brought along, and Rod drove the three of us to the restaurant. We were amused to note, that I was not the only one with the remnants of a cold bug. Both Ally and Rod were sniffling, too! At least I didn’t have to worry about “making” anyone sick! We got to the restaurant, and were greeted just inside the door, by Carlos, Damaris’ husband and partner in the restaurant. He is the “front man”—always chatting with the guests, always with a comfortable, jovial attitude that makes one feel more like a guest in his home, than a patron in his restaurant. Kyle arrived soon after us, and Rod opened a bottle of wine. We ordered an appetizer sampler plate , this absolutely beautiful serving of ceviche that I chose to use as my photo of the day, and four different entrees. Then it was Christmas! Unbeknownst to us, Allyson had decided to give gifts this evening, and presented Kyle with an absolutely fabulous pair of stone dice—made of Tiger Eye! He was thrilled. And, for me there were amazing antique reproduction buttons and a set of “my size” bangle bracelets. (When you are petite, it is so hard to find tiny bangles that don’t fall right down over your hand!) Treasures from a recent trade show or two that she’d been to, and (thankfully) had thought of us! But, we know that it is she herself, that is the real treasure. We had been looking forward to this evening—ever since Kyle first got the phone call this summer from our dear friend Rod, telling him that he’d met Allyson through our MySpace pages, and they’d begun chatting a lot, apparently realizing more every day just how much, and how many friends they had in common. Rod asked Kyle if it “would be okay” if they dated. How adorable is that? Allyson told us at dinner that when she got a friend request from this cute guy that Kyle and I seemed to know so well, she couldn’t figure out why they didn’t already know each other! So, a number of weeks (I think they were celebrating two months!) later, here they are—still quite fascinated with each other. And, since we love them both individually—the “two for one” aspect of this relationship suits us perfectly!! We look forward to many more good times with this wonderful young couple. Next time, it seems, it will include a game of some kind . . . perhaps, mah jong! After meeting Kyle and a couple of his co-workers for lunch at Mi Tierra Latin Fusion Restaurant in downtown Arlington, TX (perfectly yummy, as always!) Kyle and I went together to his afternoon eye appointment. 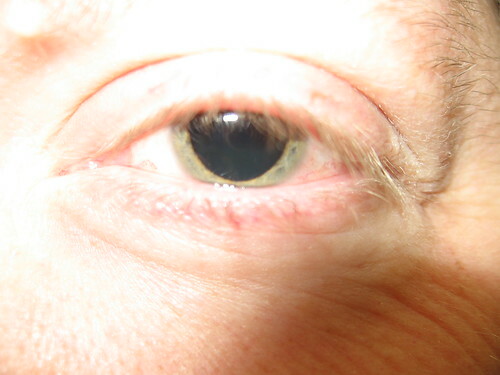 I took this alien-looking photo of his left eye, while we were waiting for the doctor. That makes one of us! 😉 I’ll feel better when it’s all over. We knew, of course, when Hurricane Ike first turned in toward the Gulf of Mexico, that our December plans could be impacted. We watched with interest, then concern, and finally with fear, as the storm worsened and the projected storm path became clearly focused on Galveston. We checked on our friends, offered beds and anxiously watched news reports as the storm surge hit, and then as the wind and rain battered the coast. 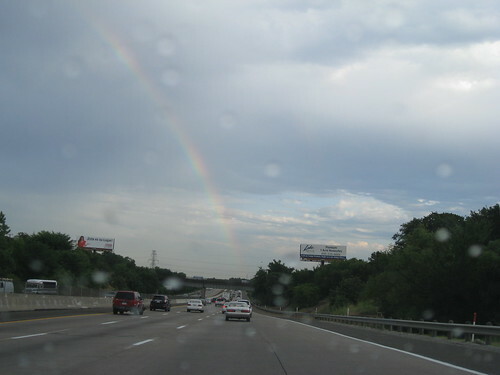 And then, as the storm passed over Texas and headed northeast, we searched for news of damage. Every day, even nearly two weeks later, we google words—Ike, hurricane, Galveston, historic, Strand, Tremont, damage, recovery, etc.—in various combinations, hoping for a news article, a photo, a blog entry, an interview—something—containing “new” news about our beloved Galveston and the recovery efforts going on there. Here, on The Daily KRuMB, we’ve tried to keep our own readership up to date on our findings, by copying text, including links, and sharing tidbits of news we’ve uncovered. Just recently, I personally reported two important bits of information that many of our friends were specifically anxious to know. 1. That I’d been given the official word that the Dickens on the Strand Festival was indeed going to happen this year, and 2. That the Mitchell properties, including the Tremont House Hotel, were planning to reopen on the 15th of October. Hi Ginger, I hope all is well! It is true the Tremont is closed as the hotel sat under water for days. We have started demo to the ballroom and the hotel will follow in the morning. We lost almost everything on the first floor from the front of the house to the back of the house. We do plan on reopening by the first weekend of Mardi Gras. I can look at changing your sleeping rooms to the hotel Galvez when I return to work on Friday. This is a disappointment to all of us; as the Tremont is rich in the history of Galveston. I will contact you soon with our progress. This has been a very emotional time for those of us who love Galveston. While the media tends to focus on the devastation – there is also much progress being made daily. I have this update to share… Apparently, our Oct. 15 reopening date for our hotels was too optimistic. Currently, the Hotel Galvez has electricity, water and elevator service and a full restoration is underway. The hotel plans to welcome guests in early November. The Tremont House sustained relatively minor damage from Hurricane Ike but the restoration process is expected to continue until early 2009. Lastly, Harbor House also sustained relatively minor damage but the hotel will not be available to the public until early 2009. The hotel is currently housing those assisting in the island’s restoration efforts. Since, Christine works for the Mitchell Historic Properties folks, and was my original source of the information about the October 15th date, I was glad to see her updated report. Glad, and of course, very, very sad. Much discussion will now need to take place among the group of us who have made Galveston Island our Victorian home away from home the first weekend in December for so many years. I am currently trying to verify that the Dickens on the Strand event will indeed be happening, as I previously reported. It does not require much imagination to think that if the Mitchell properties folks underestimated their recovery time, others, including the Historical Foundation itself, may have done the same. On a positive note, it seems that some Galveston public schools will be re-opening on the 6th of October. Life, for some, at least, will begin to return to something resembling normal. I’ve been thinking a lot about how seven years seems like so long . . . and like it was only yesterday. When I talked to Kyle this morning, he said I’d missed a call from him (I was unhooking the truck and trailer) just moments after he left the house. 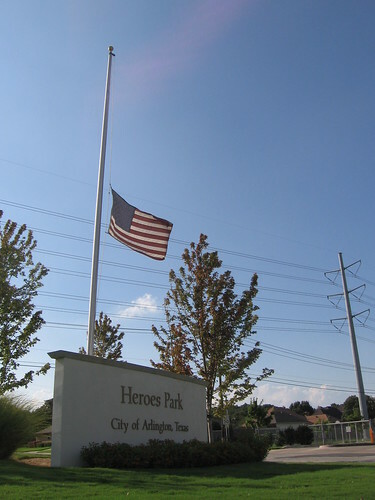 Apparently, there was some sort of ceremony taking place at our neighbourhood’s new Heroes Park. Kyle said there were police cars and sixty or so people; traffic being directed manually, etc. He was hoping to tell me, so I could run down there . . . and I would have! As it was, immediately after unhitching my rig, I chose to remember 9-11 by doing some searching online regarding any ceremonies taking place in New York or Washington. I learned that today was the day the new Memorial site at the Pentagon was dedicated. I went to the television, but could find nothing, so I read everything I could find online. Entering the new memorial, visitors pass under an archway marked with a stone carved: “September 11, 2001–9:37 a.m.,” the exact time of the Pentagon attack. The stone itself bears the scars of that attack—it is a stone recovered from the smouldering, wrecked wall of the building. The architecture of the park is arranged in rows, symbolizing the years in which the victims were born. The surrounding wall doesn’t just keep out the freeway noise—it’s built beginning at a height of three inches and rises to 71 inches—it symbolizes the youngest victim, a three-year-old, and the oldest. The park consists of a bench, a pool of water and a tree, for each of the 184 victims of the terrorist attack on the Pentagon. Each bench bears the name of someone who died there that day. To read the names of those who died within the walls of the Pentagon, you must face the building. To read the names of those who died on American Airlines flight #77, you must stand facing the western sky. I found some footage of a lone bagpiper walking among the benches as he plays “Amazing Grace.” And I found a couple of nice news reports about the new site. I also learned that at 3:30 p.m., both Obama and McCain gathered with folks at Ground Zero in Manhattan to remember the lost, there. I’m hoping to find some footage of that. We, as Americans need to remember much, much more often, how we pulled together on that day, and think far, far, less of how different we think we are, one from another. That the two candidates joined for this event, today, is heartwarming. Kyle had said he hoped something like that would be done, and I doubted the likelihood. I’m glad I was wrong. I had looked forward to this evening’s dinner for weeks! Finally, on this last night of my little holiday, Kyle and I went to Mi Tierra Latin Fusion Restaurant for what promised to be a culinary delight. I had a rather satisfying day of errands and housework, and a visit to our new favourite restaurant was the perfect finishing touch to both my day and my time at home. We took our own bottle of wine, and by the time we were done, Carlos was teasing us about the “buffet table” of food we’d ordered! We just wanted to experience as much as we could! We ordered the sampler platter of appetizers—I love doing that because you never know just what delicious things Demaris will include on that plate! Then, came the ceviche! Now, on our first few visits, Demaris was still expanding the menu offerings and the listed seafood items had been unavailable. So, the ceviche had been on my mind for weeks! And it was worth the wait! Served in a tall parfait-style glass, it was not only beautiful, but so tasty it was totally amazing and I commented that Kelly would be proud of me, ’cause I was eating it exactly as Demaris made it—complete with onions and red peppers! My taste buds have certainly matured as I am aging! Kyle ordered the skirt steak, and I the filet of cod, pictured above. We packed up two boxes of take-home food, but figured that was fine! Kyle will eat well for days! It was a perfect evening, and once again, we cannot recommend this new restaurant highly enough! 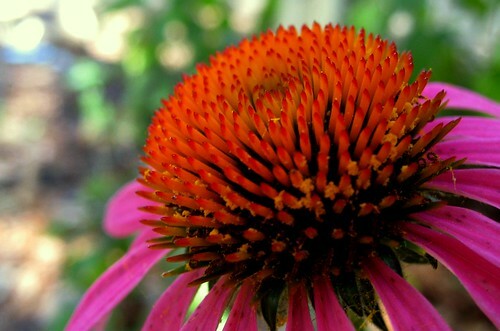 I think I’ve used this cone flower as my photo during this week every year. Last year, I took a photo of it on the 10th of July. I’m not sure when it flowered, but it must have done sometime between when MB left and the 4th of July (when I noticed it). I can’t tell you what makes a flower bloom so beautiful in the midst of our Texas drought and heat; but, it’s a beautiful sight and it makes me smile when I walk out the front door and see it. Marita Beth’s decision to plant the cone flowers in that front square garden directly in front of the door was inspired. Tuesday. The days are all starting to run together. Packing. Consumes. Me. I must type the word for the day of the week, in order to remember it. I did have a doctor’s appointment today—all good. I have an official diagnosis and name for something I’ve been dealing with for twelve years: supraventricular tachycardia! Doesn’t that sound impressive? I was in a pretty good mood when I left The Heartplace (yes, that’s what it’s really called! ), so I decided to treat myself to lunch. I considered driving through a fast food place on the way home, and then got a bold idea. I was really only blocks away from Mi Tierra—the new Latin Fusion restaurant owned by a friend. So, that’s where I went—all alone—and enjoyed their appetizer sampler plate as my lunch. Anyone who knows me will understand how much I must love this food in order for me to go into a restaurant by myself and sit there and eat alone! But, really . . . I’m not gonna get to eat there again until September! A rare rainbow on my home from work. Minutes before, while it was raining quite hard though the sun was shining, I heard Terrill tell some ladies that that meant we were at the end of the rainbow. I’d always heard it meant that the devil was beating his wife, but that never made sense to me. I like Terrill’s explanation better. Friday—our “girls who lunch” day! I’d been really looking forward to this. Not only because I love spending time with my girls, but because our pre-arranged meeting place today was Mi Tierra! Last Friday, Kyle and I had been a part of a group of folks who descended on this wonderful little restaurant on its opening day. After months of anticipation, we were very pleased to be among the very first customers to patronize this charming place. Damaris, the restauranteur, and her own chef, was once a co-worker of Kyle’s at American Airlines Cargo. After a rather lengthy career with the airline, she finally decided to walk away from that and all the headaches that daily cubicle life entails, and trade it in for a chef’s jacket and a whole new set of headaches! We enjoyed our meal and our experience so much that day, that I immediately suggested that we girls meet there the next time we lunched. When I arrived, about ten minutes before our planned meeting time, I was greeted by Giovanni, the teenage member of the restaurant family. I reminded him I’d been there recently, and that Damaris and Kyle were friends, and he disappeared into the kitchen to tell his mom I was there. I enjoyed a brief visit with her, where I got to tell her once again how much we enjoyed our lunch last Friday—so much in fact, that I was back with my girlfriends, today. As we chatted, she seemed genuinely pleased we were there, almost as pleased perhaps as she’d been earlier this week when another group from the airline campus came for lunch—including a big vice president! I asked how the first week in business had been, and she said that they were so busy over their first weekend that they ran out of food on Sunday! What a great problem to have when you’re a three-day-old restaurant! And, it’s no wonder! All four of us were completely delighted with our meals and our service and our whole luncheon experience. We ordered a sampler platter of appetizers that included sweet plaintains, and empanadas and wonderful little balls of potato-yumminess! Ginger and I both ordered Caribbean Lasagna, and it was so tasty it was all we could do not to lick the plates! Kelly and Sherrie both ordered meals (whose names are in Spanish, so I can’t remember them) involving rice and plaintains and pork, and both of them had servings big enough they took home leftovers for another meal or two! We took our own bottle of wine (the liquor licensing is still in the works) and a corkscrew was cheerfully provided with no corking fee. I was very proud that the girls all seemed to love their meals, and even prouder when Damaris came out of the kitchen to meet everyone! This is a talented woman and we sure do want to see her succeed! Delicious food, excellent value pricing, friendly, attentive service—it’s a class act. The only problem: I’m about to go away for nearly three months, and have to wait ’til September to go back there again!! So, I’m hoping our Daily KRuMB readers will all pay Damaris a visit, while I’m gone. And, I can promise you: one visit won’t be enough!! Tuesday – Saturday 11 a.m. – 8 p.m. Sunday noon- 8 p.m.
Friday, the Thirteenth! Certainly far from unlucky for me, for I had the good fortune to dine in three completely different restaurants on this day—enjoying three totally different cuisines! The “foodie” in me was a very happy camper! Yesterday, my husband surprised me with an invitation to join him, and a number of his co-workers at the opening day luncheon today, of a new restaurant here in Arlington. A former co-worker of his, a lovely lady named Damaris, has realized a longtime dream, and opened Mi Tierra—a Latin Fusion Restaurant on Abram Street in downtown Arlington. Damaris, a native of Puerto Rico, has her sister and her mother with her in the kitchen, and her husband, Carlos, warmly greeted all her guests on opening day. He shared with us that at least one day a week, he will get to cook, too! Their son, and at least one other server, ably, yet with a charming amount of nervousness, dealt with the nearly full house resulting from our group’s attendance. The opening day menu was far more limited than the regular menu will be, but we enjoyed deliciously-prepared plantains and Cuban sandwiches. Others at our table were equally well-pleased with their salads and fajitas and flank steaks. 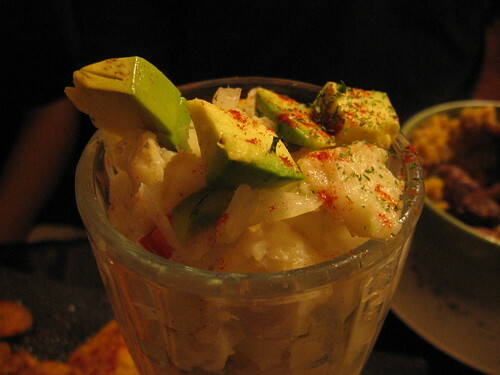 I personally look forward to my next visit when I plan to try the Ceviche! Immediately after finishing this delightful meal, and congratulating our hostess and chef, I kissed my husband goodbye and drove to Hurst where I was to meet girlfriends for lunch! This “second lunch” was planned last Friday when we wrapped up our sushi luncheon and decided that a weekly luncheon date was a good idea. We settled then on Italianni’s as the place—it being a longtime favourite spot. 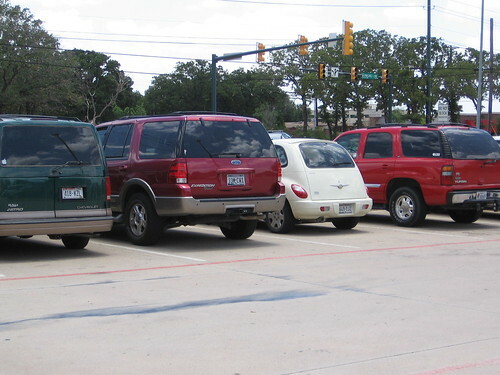 As I drove into the carpark and took the first available space, I was amused to realize that the four of us girls, had each driven our own vehicles to the mid-cities, and then parked one after the other, in a row! So, I converted the visual memory into a digital image as I crossed the parking lot and entered the restaurant. That’s the photo above—the wheels of Kelly, Ginger, Sherrie and MB. Obviously, I was the last to arrive—the other three were already enjoying conversation and perusing menus. I was not much in the way of “hungry” after my wonderful Latin meal, so I ordered only the amazing fried spinach side dish that we all love so much at Italianni’s. 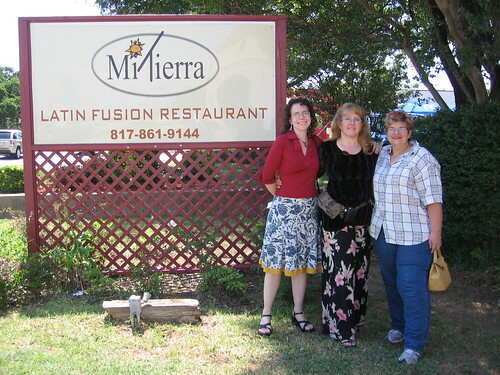 We girls enjoyed our time together and made plans for yet one more luncheon next Friday—at Mi Tierra! 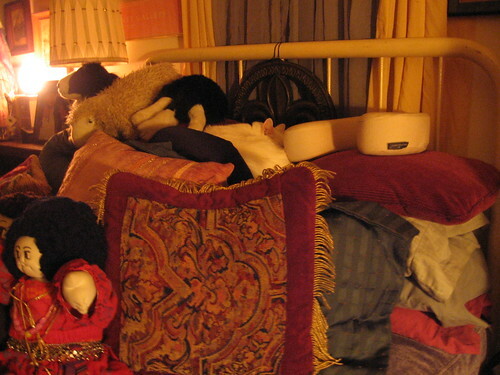 After a super-fast mini fabric safari, I went home to my husband—it won’t be long ’til I’m many miles away and have only the cat to “go home to” when I’m out. Leaving home for Bristol every summer, is so hard. I wasn’t home for long it seemed, when Terrill called and asked if we’d like to join him at No Frills Grill. No surprise our answer was “yes,” and off we went. My husband however, it seemed had been plotting to treat me to Tex Mex and a margarita for dinner, so we did not stay to eat. Instead, we played some trivia and then went to Mexican Inn. Hence my third (actually fourth if you count NFG) restaurant, and uniquely different dining experience of the day! I meant to take a photo of my enchilada plate when it arrived, but I was distracted by how tasty it looked and when next I thought about it, my plate looked like this! It was a delightfully yummy day! Friday the 13th. 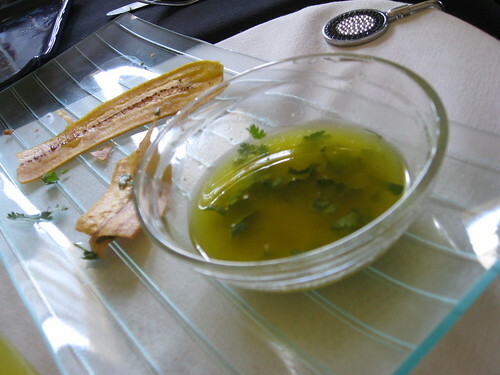 Rather than dwell on the fact that it’s Friday the 13th, and rather than comment on triskadecaphobia, I choose instead to write about the remains of the plantain. A dear friend of mine, after many years working with me, gave it all up to pursue a life-long dream. She is now the owner and primary chef of a Latin fusion restaurant in "downtown" Arlington, TX. 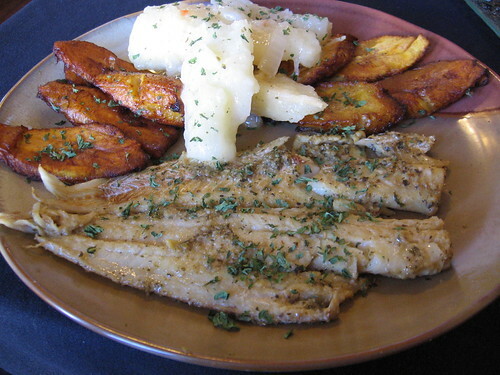 Called Mi Terra (My land), it offers an impressive menu of various Latin cusines. On this day, this day the superstitious shun, my friend, Damaris, opened her restaurant to the world. Many of her co-workers and friends showed up to celebrate with her her opening-day lunch. Of course, with so many people showing up, she got stuck in the kitchen, but I am sure she didn’t mind overmuch. Here, I snapped a quick shot of the plantains and the delightful garlic/lemon dipping sauch before they disappeared completely. Our hat’s off to you, Damaris, and we wish you ALL the very best! 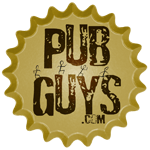 You can count on our frequent patronage.